Turn on the ceiling fan – The air pushed down from a ceiling fan on medium or high setting may reduce the chance your chances of getting a bite. The wind will dilute the carbon dioxide around you, reduce your body heat and keep sweat to a minimum. 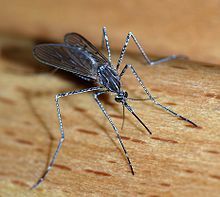 Mosquitos are attracted to carbon dioxide, your body heat and your sweat. Invest in netting – If this is a common issue or you are sleeping on a porch, the netting will keep mosquitos from getting to you. Simple netting hangs over the top rails on a 4 post style bed. Another thing that may cause problem is lack of screens on window. Cut mosquito net into square and staple around windows. Check for gaps – Inspect your bedroom for gaps under the door. If there is a large enough space for a mosquito to get through, it may. Poor workmanship or age may create a gap. Repair or replace doors as needed. Let Absolute Pest Control help you with any pest control problem you may have in your home or office. Our trained technicians can assist you no matter where you live in Middle Tennessee. Call 615-220-1933 today!